Residential/Commercial Property Maintenance, Lawn Mowing, Landscaping, Seasonal Cleanup, Mulch, Gutter Cleaning, Snow Plowing, Snow Blowing, Deck / Roof Shoveling, Sanding, Tractor Work, Shrub Trimming, Powerwashing, Garbage Pickups, Flower Maintenance & Installation and Cleaning Services. We offer free estimates! We are licensed and Insured. We also offer dry & liquid turf fertilization, crab grass & weed control, insect control, tree & shrub planting and new lawn establishment. 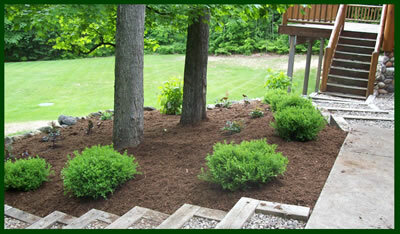 Please click here to view a photo gallery of a recent landscaping job!